It was apparent from the Energy Demand Analysis that much of the housing stock in Knocklyon was energy inefficient and that a retrofit programme of energy-saving measures was needed. Furthermore it was felt, from attendance at various SEAI Seminars, etc that the best way to promote an Energy Retrofit or Energy Upgrade Programme was to start with a Pilot Community Project which could develop into larger projects as more Residents / Property Owners became aware of the benefits of joining in the programme. The SEAI Grant Funds were then utilised to appoint an Energy Specialist (IHER Energy Consultants) to carry out energy assessments on 15 different house-types in the Knocklyon District whilst simultaneously identifying a suite of energy-saving retrofit measures specific to each house-type that would provide an informed basis for discussion with potential participants in a Pilot Community Retrofit Project. A sample Energy Assessment Spreadsheet with recommended energy-saving measures is attached. In order to encourage participants and to generate a greater awareness in our Community of the need for energy-saving measures we then staged a local Energy Show in April 2018. This took place in our large St Colmcille's Primary School and consisted of part AV Presentations and part pop-up stands of relevant Companies and Agencies in the Energy Business including the SEAI. Pop-up stands included External / Internal Insulation, Thermal Windows, Solar pv Panels, Condensing Boilers, Heat Pumps, Electric Cars, etc. The Event was attended by approx 170 people and approx 70 completed Expressions of Interest (EoI) as per attachment in a Pilot Community Project of actual energy upgrades. In terms of implementation KN SEC had the option to project-manage and deliver the Pilot Community Project itself but decided instead to enter into partnership with an established Project Management Company (REIL) and associated Energy Company (Enprova) to draw on the carbon credits, as this was our first physical works project. KN SEC then liaised with Residents in terms of supporting them during the physical works and in the case of the Community School jointly completing a lighting schedule of existing lighting fixtures. Knocklyon Network (KN) is a fully voluntary Not-for-Profit Agency which was set up in the largely residential Knockylon District of Templeogue, Dublin 16, during the economic downturn to facilitate "people networking" for people seeking re-employment. More recently in 2016, KN broadened it's activities and in particular it set about responding to the widespread public concern about the huge damage to our environment being caused by the continuous use of harmful carbon-producing fossil fuels by establishing a Sustainable Energy Community (SEC) in partnership with the Sustainable Energy Authority of Ireland (SEAI). An SEC is essentially a Community based vehicle envisaged and supported by the SEAI for the purpose of enabling Local Communities to embark on Energy Projects with SEAI Community Grant Assistance. Such Projects are designed to reduce our dependence on fossil fuels through implementing energy-efficiency upgrades which reduce the production of harmful carbon gases in our environment, reduce energy bills and also most importantly to promote the generation / use of sustainable clean energy (i.e. following the REDUCE / PRODUCE maxim). In 2016 KN, formed an Energy Sub-committee (KN SEC) and having submitted it's Charter to the SEAI setting out it's aspirations in terms of promoting energy efficiency and sustainability it then applied for, and succeeded, in it's application to the SEAI for a Grant of €15k to set about the development of Energy-efficiency and Renewable Energy Generation Projects in the Knocklyon District. Based on these EoIs KN SEC in consultation with the SEAI then proceeded to embark on the Pilot Community Project of physical works to deliver energy grades to a number of different house-types (for which EoI's had been received) as examplars to other potential stakeholders and combined this with a further project component for replacement of all existing lighting in our second-level St Colmcille's Community School with full LED Lighting (approx 800 lights & fittings). 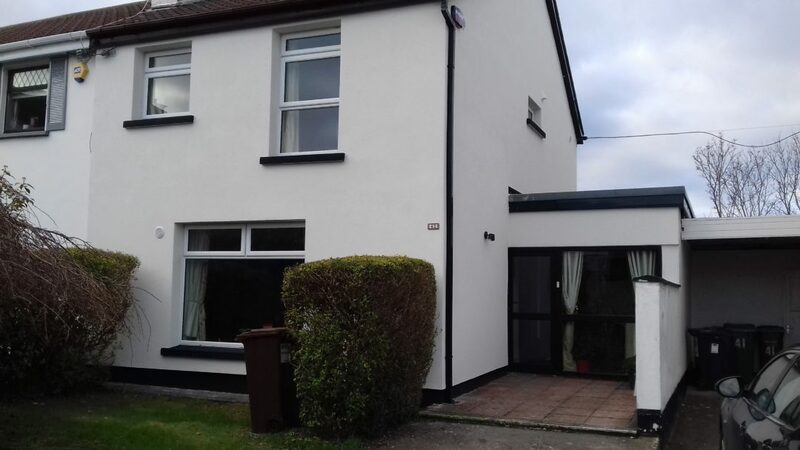 Over the course of the next six months 5 houses had substantial energy upgrade works carried out such as full external wall insulation (known as External Wraps), heat pumps and complete replacement of doors and windows with more thermally efficient versions (approx value €100,000). The swap-out of Lighting in the Community School with full LED Lighting (approx value €80,000) was also completed in this period. In parallel with the above activities we also engaged an Energy Consultant (using the SEAI Grant) to investigate the potential for the installation of Roof Mounted PV Panels for sustainable power generation at St Colmcille's Community School. We also asked the Consultant to develop an appropriate Technical Specification tailored to the School's Energy Demands (the School is intensively used in summer months by Language Schools and is also intensively used in Evening Hours for Adult Courses). A Feasibility Study for the Roof-mounted PV Panels was completed in August 2018 and a recommendation provided regarding the most appropriate system to install. In November KN SEC appointed a further Specialist Consultant (Energy Solutions), using the remaining SEAI Grant funds, to undertake the development of it's Energy Master Plan (EMP) which will consolidate all of our data / reports gathered to date and identify appropriate energy projects for future years as well as 2019.